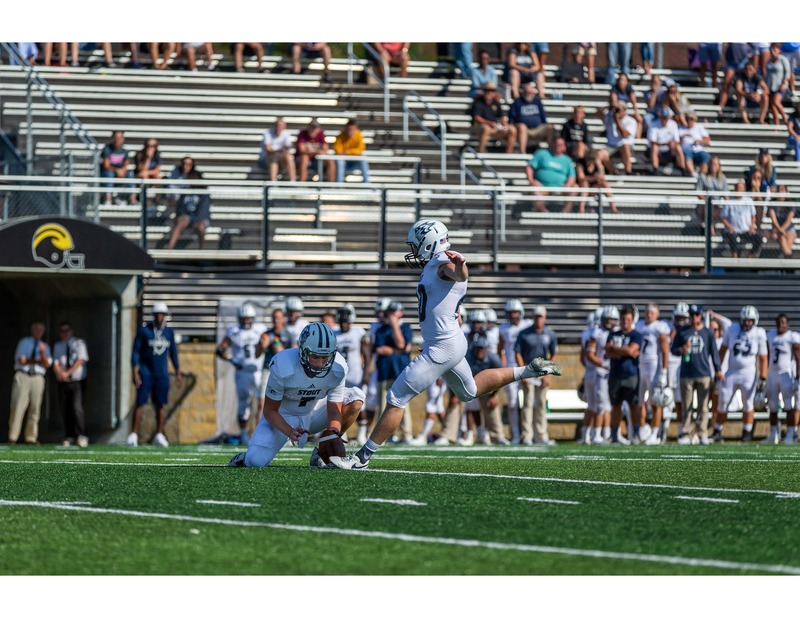 This issue’s Student-Athlete Spotlight is Drew Pearson a senior and kicker on the UW-Stout Football Team, Pearson is majoring in information and communication technologies and is from Wausau, Wisconsin. I chose Stout because I believed I was a very hands on person who would succeed in a polytechnic school type. I also took into account the distance away from home as well as the available majors! Outside of school and athletics, I love to hang out with my family and friends, watch the Packers and the Chicago Blackhawks. Some interesting facts about me include that I have an older sister, Morgan, who has just received her chiropractic degree. I am actually mostly of German heritage though looking like a leprechaun, as well as being a huge fan of Marvel movies and comics. My favorite pro athlete is Steve Smith. Back in 2006 he was unstoppable in Madden so I started watching and observing him in real life. His attitude and determination are unlike anyone I have ever observed. He was sometimes criticized for his rash decisions but they showed me how much he cared for what he was doing and how emotion is such a powerful tool to control and harness. My plans for after college are to get a job. Specifically, I would love to continue to play football at the pro level, but if i don’t find that opportunity, I would like to find a job somewhere other than the Midwest becoming an technology education teacher.